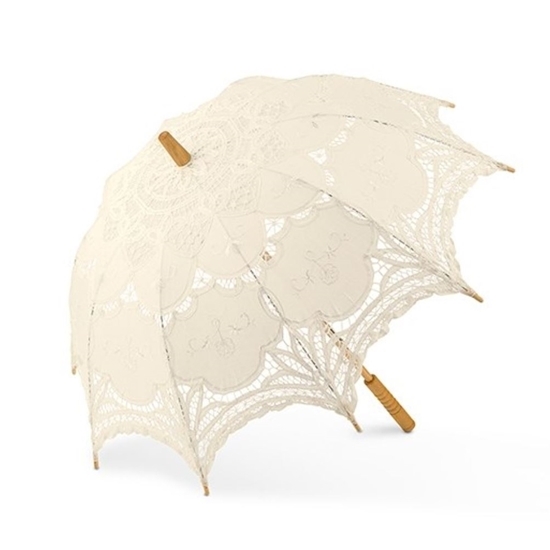 This classic parasol is made of cotton, polyester, and battenburg lace for an antique, vintage appearance. It measures 29' in. and can be used as a prop, decor piece, or an accessory. Open up your parasols because it’s raining confetti. Spring and Summer are seasons that bring people outside. Its warm, inviting atmosphere is a cause for many to desire an outdoor wedding. Our lace parasol allows you to fully enjoy the outdoors while blocking direct sunlight as well as adding style to your attire. It adds a vintage flare to your wedding theme and even looks great in photographs. It’s a charming accessory for a dazzling celebration.